WASHINGTON — In a trove of newly leaked emails, former Secretary of State Colin Powell calls Donald Trump "a national disgrace" and suggests his own Republican Party is "crashing and burning." Powell also laments Hillary Clinton's attempt to equate her use of private email at the State Department with his. Powell, 79, did not respond Wednesday to a phone message or email seeking comment. He earlier told BuzzFeed that he does not deny the emails' authenticity. In the emails, Powell said he stayed relatively quiet during the rise of Trump, the Republican presidential nominee. "To go on and call him an idiot just emboldens him," Powell said. To a former aide he writes, "No need to debate it with you now, but Trump is a national disgrace and an international pariah." "All his lies and nonsense just pile up," Powell wrote. "I just go back to the unforgivable one. Trying to destroy the President elected by the American people with his fictitious investigation into this source of birth. Absolutely disgraceful." Trump, in a Twitter post late Wednesday, said, "I was never a fan of Colin Powell after his weak understanding of weapons of mass destruction in Iraq = disaster. We can do much better!" Powell, a Republican, also suggests frustration with the state of the nation's politics. "We all need to start voting for America and not our parties," Powell writes. "Trump is taking on water. He doesn't have a GOP philosophy or even a Conservative philosophy. We need a revolution and it will begin with the GOP crashing and burning up its current form." The release of Powell's emails is the latest in a string of leaks that appear intended to influence the 2016 presidential election. The FBI is investigating how thousands of Democratic National Committee emails were hacked and released, an embarrassing breach that Clinton's campaign maintains was committed by Russia to benefit Trump. 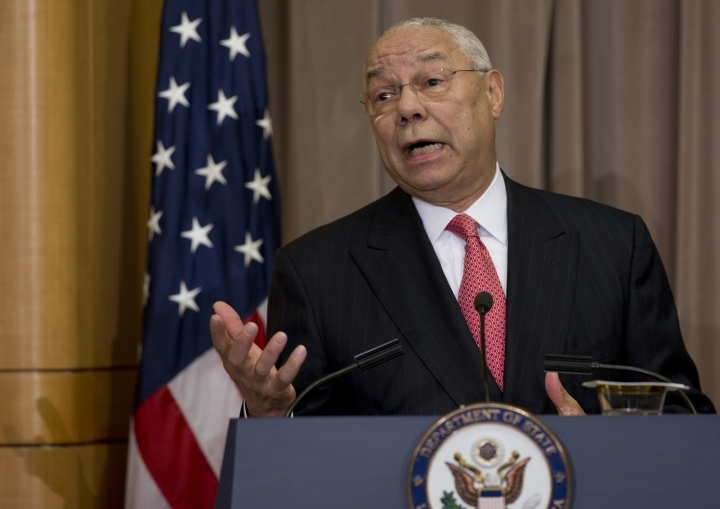 Powell's leaked messages include his thoughts on Clinton's lingering email woes. He criticized Clinton aides for tying him into the controversy over the Democratic nominee's use of a private email server while she was secretary of state. Powell wrote that he had told Clinton's "minions repeatedly that they are making a mistake trying to drag me in, yet they still try." In another spot, he declared of Clinton that "Everything HRC touches she kind of screws up with hubris." The messages contain comments that reflect that he, too, sought to use private email as a way to avoid creating documents retained by the government. Decrying "friggin record rules," Powell wrote that he "saw email more like a telephone than a cable machine." Congressional Democrats have seized on the use of a private email addresses by Powell and former Secretary of State Condoleezza Rice as a foil for Republican attacks on Clinton. By suggesting that he didn't view work conducted via private email as a permanent government record, Powell could offer those Democrats additional ammunition. In May, Powell messaged with a former colleague as the State Department's inspector general prepared to release a report critical of both his and Clinton's use of private email to conduct government business. "Wow, I didn't follow rules," Powell wrote. "I only revolutionized the information system in the entire State Department. ... I think I'll bash the Department tomorrow. Fifteen years later they come up with this. ... Thanks Hillary."